I love giving homemade food gifts for the holidays. 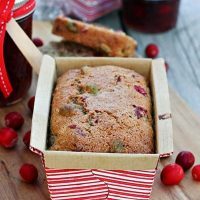 Taking the time and effort to make a favorite treat or baked good, like this Cranberry Pistachio Bread, is always appreciated by friends and neighbors on my holiday gift list. I baked these hearty mini-loaves using two Bob’s Red Mill flours–both organic whole wheat and unbleached all purpose white flour. I often combine whole wheat and white flour in my baking for a nutritious twist, and it’s a technique that works especially well with this recipe. Bob’s Red Mill Organic Whole Wheat Flour is stone ground from organic hard red wheat so all of the nutritious bran and germ is still intact. 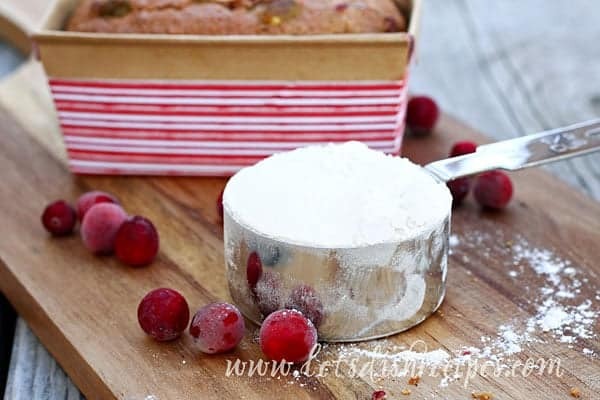 I especially like adding it to this cranberry bread recipe and baking the batter up in muffin tins for a tasty, on-the-go breakfast for my kids. 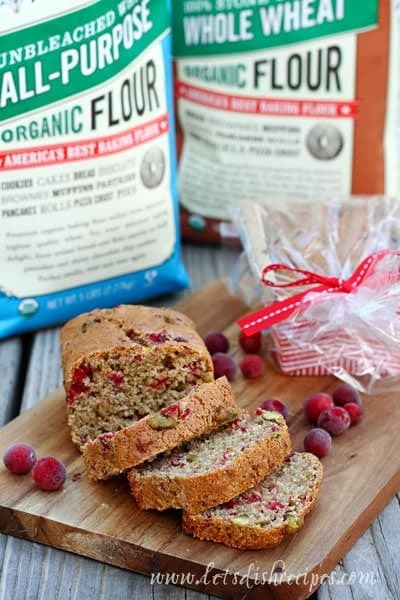 When I bake this cranberry bread for holiday gift giving, I usually opt for all white flour, and Bob’s Red Mill Organic Unbleached All Purpose White Flour is a great choice for producing light and airy baked goods with a wonderful texture. It’s a kitchen staple that’s perfect for all of my baking needs, any time of year. Besides being thoughtful–and delicious–homemade food gifts can also be an economical approach to holiday gift giving. Especially if you have a long list of neighbors and teachers who you’d like to give a little something to. 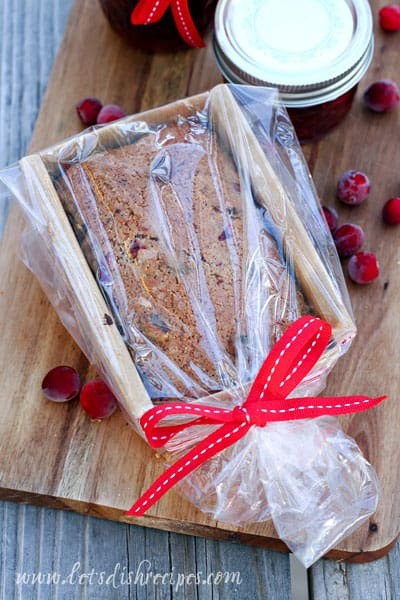 All you need to transform this Cranberry Pistachio Bread into a fun gift is a cellophane gift bag and a pretty ribbon. Oven-safe, decorative paper baking boxes are also inexpensive and easy to find this time of year. For an extra special touch, you could even include a handwritten recipe card or a jar of homemade jam. And right now, Bob’s Red Mill is helping you stretch your holiday dollar a little bit further. Simply click here to download a $1 off coupon for any Bob’s Red Mill product! Whichever flour (or combination of flours) you choose, this tasty quick bread is a bit of home baked goodness for the holidays. Of course, you can always substitute other nuts, like pecans or walnuts, for the pistachios in this recipe. 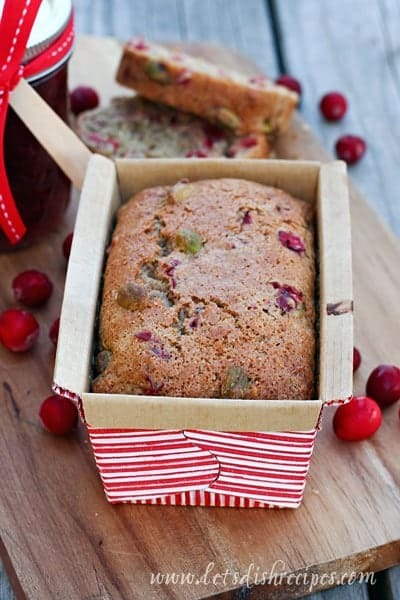 I just love using pistachios and cranberries this time of year because they look so festive together! For more recipe ideas, and to see the full line of Bob’s Red Mill Products, visit their website, or follow them on Facebook, Twitter or Pinterest. Preheat oven to 350 degrees. Grease a 9×5 inch loaf pan, or 3 mini loaf pans. In a medium bowl, mix together flour, sugar, baking powder, soda, salt and cinnamon. Stir in orange juice, zest, oil, and egg until well blended. Fold in cranberries and nuts. Spread batter evenly in loaf pan(s). Bake for 55 minutes (25-30 for mini loaves) or until toothpick inserted in the center comes out clean.Cool for 15 minutes before removing from pan. I like to make baked goods for gifts too, especially this time of year. 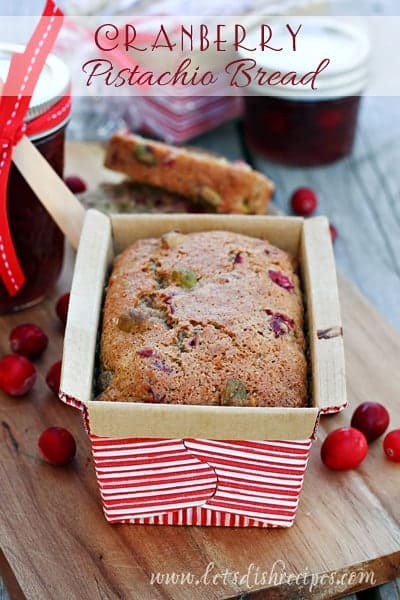 I love quick breads and the cranberry and pistachio combination sounds so good. I love gluten free products and use Bob’s Red Mill stuff all the time. It’s great.